Our Annually Renewable Unlimited User Site License Teacher Packs allow you to distribute the programming tutorial and the associated source code to any of the students who attend your computer science classes. You can customize and personalize the programming tutorial and the associated source code to fit your unique teaching style whether the class is self-study or instructor-led. Since these tutorials are distributed in an editable Microsoft Word format you can add your own teaching text and/or notes around our teaching text. You can also add your own diagrams ​and/or personalize the E-Book tutorial to fit your specific teaching needs. Unlike other tutorials and books that are paper or just PDF based, you can modify our teaching narrative and thesource code inside the tutorial and reprint as needed. Each Lesson comes with the completed native source code solution in a separate .zip file so you have the completed and working programs at your finger tips. Each tutorial can be a stand alone self-study unit or they can be instructor led and facilitated by you. This unique flexibility for teachers sets us apart from all other Textbooks and E-Books on the market. To see some pictures of one of our programming tutorials being taught to High School students click here. To see a sample list of our Unlimited User Teacher Edition Site customers, click here. 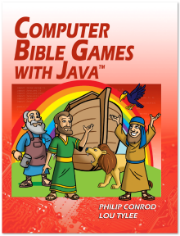 COMPUTER BIBLE GAMES FOR MICROSOFT SMALL BASIC is a self-paced “beginner” programming tutorial. This tutorial consists of 13 chapters explaining (in simple, easy-to-follow terms) how to build Computer Bible Games in Microsoft’s Small Basic programming language for beginners. 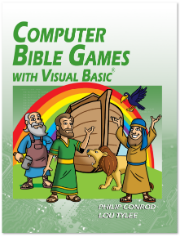 COMPUTER BIBLE GAMES WITH VISUAL BASIC® is a self-paced semester long self-study “beginner” programming tutorial consisting of 13 chapters explaining (in simple, easy-to-follow terms) how to build a Visual Basic Windows application and Computer Bible Games. 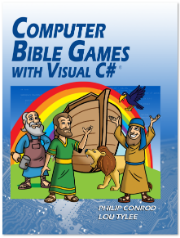 COMPUTER BIBLE GAMES WITH VISUAL C#® is a semester long self-paced “beginning”programming tutorial consisting of 13 chapters explaining (in simple, easy-to-follow terms) how to build a C# Windows applications and Computer Bible Games. 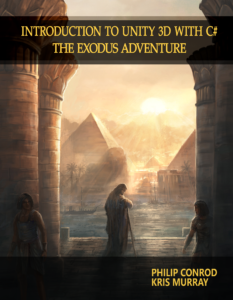 Introduction to Unity 3D using C# is a semester long self-paced “intermediate” programming tutorial consisting of 17 chapters explaining how to build a Unity® 3D Computer Bible Adventure Game surrounding the events of the Exodus. This Tutorial requires a some previous exposure to the Visual C# or Mono C# programming language. Our COMPUTER BIBLE GAME WITH VISUAL C# would help your student gain that exposure. - Carly Orr, Computer Science Teacher, Vancouver BC.